This guide will teach you how to properly overclock your Phenom II, and squeeze out every last drop that the CPU has to offer. It has been a very long road with this guide. Most of you that have been around the forums know about “Dolk’s guide” if you have ever wandered into the AMD section. Otherwise, maybe you’ve heard of it from the references across other enthusiast forums who link back to Overclockers.com for the instructions. The guide has had many re-writes to update details or add more in-depth information about CPUs in general. After a long time of re-writing and waiting on AMD to push out all of their CPUs, I want to share with the community the final guide for the Phenom II CPUs. The guide progresses through three main sections – Prerequisites, Before We Overclock, and Putting It All Together. Prerequisites explain basic details to understand the guide. Before We Overclock details the 3 major subsystems which are key to overclocking this family of processors and is helpful for understanding how things work together. Putting It All Together explains exactly which steps to follow to find your maximum overclocked settings. And finally, the guide wraps up with several subsections to assist you if you run into trouble. This guide will use some basic terms that you may not be familiar with. Here are the most common terms that I will be referring to. HT or HTL = Hyper Transport Link (do not confuse with HTT). All references to HT or HTL will here be referred to as FSB. Callisto, Deneb, Heka and Thuban = The names of the different Phenom cores. It is always important to know the stock settings for your particular CPU. Make sure you know this before getting started. A good place to confirm stock specifications is AMD’s desktop processor product list. Find your CPU in that list and click “view detail” to find the stock frequency and voltage settings for your chip. Then, when you switch from automatic to manual mode, you do not start off too low or too high with your overclocking. Listed below are the typical stock voltages of a Phenom II. Please make sure to look up the default values for your specific CPU at the link provided. For those interested, more complete processor specifications can be referenced in the AMD Power and Thermal Data Sheet. NOTE: Please be familiar with your motherboard BIOS. All of the settings that I refer to will be located in your motherboard BIOS. Each manufacturer’s motherboard BIOS is unique, referring to the same settings with different terminology and layout. A good place to start is confirming where each setting is located before beginning to overclock. Deneb was the first Phenom II core released. After the rather disappointing Phenom was on the market for a year, the Phenom II brought AMD out of a huge hole as although the Phenom II did not compete on par with Intel in the benchmarking world, it did bring to the market a low cost CPU that was just as good if not better when it came to gaming. The first Phenom II was the 940 BE which was followed closely by the 920. The 940 BE was the flagship CPU, in some cases reaching 4.0 GHz with water cooling and benchmarking with 3D Mark06 at 6.5 GHz. This was something never before seen from an AMD CPU. Soon after, the 720 and 500 came out onto the field, bringing the possibility of core unlocking with them. Both the hobbyist media and overclockers rejoiced at the fact that 2 or 3 core Phenom IIs could be unlocked to 4 core CPUs relatively easily. With the Phenom II, a new era of overclocking was created. Even though they are not as powerful as their Intel competitors, they create a different game when going cold. Intel CPUs have historically struggled with cold temperatures, as the CPU would start to become unstable upon hitting a certain temperature. Shortly after the release of the Phenom IIs, it was discovered that they could still operate at a temperature below even that of liquid nitrogen (-196 C) . For the first time, liquid helium (boiling point: -269 C) was brought into the field of overclocking. Only a few people have ever used this very expensive substance, but the results have proven the utility of liquid helium. After a year of the very successful Deneb series Phenom II, Thuban was released. Thuban was not a redesign of the CPU, but tapped into the (as yet un-released) power of the Deneb. Thuban brought to the market more cores and a much more powerful internal memory controller (IMC). With these new buffs the Phenom II got a new boost in the CPU market. Advertised as the lowest cost 6 core CPU, it brought extra fun to overclocking in the benchmarking world. Although the Thuban and the Deneb are sister and brother in nature, they tend to behave differently when overclocking. The Deneb is much hungrier when it comes to voltages and it does not cope well when the core temperature is anywhere near 55 C. The Thuban is much more gentler, and allows higher clocked cores without the need for high voltages. What really separates the two in the overclocking world is the balance between the four parameters: CPU Cores, CPU-NB, HTT, and RAM. Deneb allows you to effectively ignore the CPU-NB or the HTT. It only cares about how much voltage you are giving it, and how cold it is. Thuban wants everything to be happy, and requires harmony between all four areas. In this section I will teach you overclocking basics for the Phenom II. The Phenom II is typically an easy processor to overclock. In no time, you should be able to go from 0% – 29% using your stock cooler and thermal paste. Going above and beyond however, things will start to become more complicated, especially as you try to factor in higher benchmark scores with your overclocks. The first thing to learn is the basics of your RAM settings. Your RAM has a direct link to your CPU, there is no chip in between – the CPU has an IMC (integrated memory controller). There are two parts to the memory settings: frequency and timings. The memory frequency is determined from a ratio, composed of the FSB (Front Side Bus) Frequency and the DRAM Frequency (Seen as FSB:DRAM). 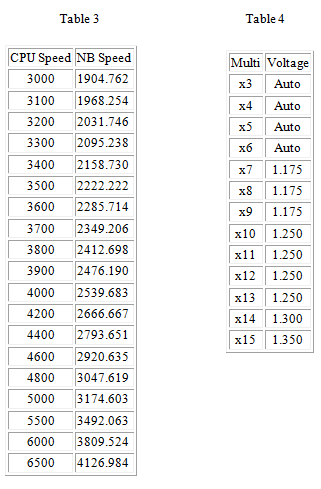 Table 1 shows an example of some common ratios. The memory frequency can be changed by changing the the FSB frequency and/or ratio. Using one of the ratios and a simple equation, you can determine the speed at which your RAM is running. For example, I will calculate 1600 RAM, using standard AMD Settings which is a 200 FSB frequency setting. You now have some really fast RAM (in fact this is most likely not possible for most RAM). But the general idea is that the FSB of your CPU will determine the speed of your RAM. By using the equation from above you will be able to calculate your RAM speed. This will serve as a very useful tool as you overclock your Phenom II. NOTE: When configuring the ratio of your RAM, not all BIOS’s will be the same. Each motherboard maker has their own way of making their BIOS. Please consult your motherboard manual to determine how to configure your RAM ratio. The RAM ratio will be shown in one of two ways depending on your motherboard maker. The first way is the basic ratio, just like my table from above. The menu will allow you to choose the ratio you want. The second way will show the four basic DRAM Frequencies. They will go in order 800, 1066, 1333, and 1600. These numbers represent the ratio you wish to use. Now that you know how to determine the speed of your RAM, you can now set the timings of your RAM. Your RAM timings represent the number of cycles it takes for information to be processed. There are several different types of timings you can modify but there are only six that you will want to work with. Depending on your motherboard maker, you should be able to fine tune your RAM timings. I would suggest that you do not touch the other settings not covered here unless you know what they do. The six timings that you will tweak are: Cas Latency (CL), RAS# to CAS# Delay (tRCD), RAS# Precharge (tRP), Cycle Time (tRAS), Bank Cycle Time (tRC), and Command Rate (CR). These timings are directly affected by the speed of your RAM. Depending on your RAM manufacturer there are a couple of basic timings that you will most definitely use while overclocking the Phenom II. Each timing works with a corresponding DRAM Frequency. NOTE: You can look up your default timing by using a free program called CPU-Z and going to the SPD Tab. Table 2 is only a reference and may not apply to your RAM. The timings are most commonly represented as CL-tRCD-tRP-tRAS. For example: 5-5-5-15. For now, the default timings of your RAM should prove to be the best for overclocking. Lower numbers are better when talking about latencies. With the speeds increasing for memory, it is normal that latency increases for stability purposes. In some cases you will find that 7-9-7-15-30, or something similar, will be the best for speed and stability. In essence it will come down to you playing around with your timings and testing them to find the best balance of both stability and speed. In most cases I have found that keeping the RAM at 1600MHz for DDR3 and 1066 – 1200 MHz, for DDR2 provides the best stability and performance. This rule goes as far as extreme overclocking as well. The reason behind this is due to the IMC limitations. This will be talked about in more depth under the CPU/NorthBridge section. The discussion of the Phenom II itself is separated into two parts: Part 1 covers the cores of the CPU. Part 2 covers the CPU-NB, and HTT but the main focus is the CPU-NB. The HTT and a couple of other things are what make up the CPU-NB but to make things more straightforward, I will talk as if the CPU-NB and the HTT are two different entities. For the first part of the CPU, you have the cores. The cores are connected by the FSB or HT Link (HTL) – even the CPU-NB runs on it. The FSB always has a stock frequency of 200 MHz. The core speed is then determined by the FSB multiplied by the CPU multiplier. The FSB frequency also affects the CPU-NB and HTT. In order to overclock your computer, most people would simply increase the FSB because the CPU is typically multiplier locked. In 90% of cases this is true, but the other 10% of people have something called a BE or Black Edition CPU. These CPUs have an unlocked multiplier and will allow the user to just increase the multiplier of the cores, thus increasing the speed of the CPU. So let us look at how the FSB and Multiplier can be used to overclock the CPU. For my first example I will use the Phenom II 810. This CPU has a stock speed of 2.8 GHz. With the 810, I can only increase the FSB in order to overclock the CPU itself. So for this next example I will increase the FSB to create a 3010 MHz CPU or a 3.01 GHz core speed. For this next example I will take a Phenom II 940 BE CPU and overclock it. Remember the BE CPUs have an unlocked multiplier so increasing the FSB to get a higher clocked CPU is not necessary. There are many benefits to this and they will be discussed in detail later in this section. Just using the CPU multiplier I was able to up the CPU speed to a clock speed of 3000 MHz or 3.0 GHz. One question is probably in your mind: is there a difference between increasing the FSB rather than the multiplier and vice versa? In truth, no. If you have a BE CPU, there is no difference other then what will be talked about later in this section. But for a CPU that has a core speed of 2.8 GHz that is increased to 3.0 GHz either technique will create a faster CPU: by increasing the FSB or the multiplier or both. Just know that modifying the FSB will also affect things other than the CPU core speed. As a side note, in certain situations for BE users, you may find increasing the FSB and then the multiplier results in a more stable overclock. Now that you understand how to overclock your CPU, let’s look at the second part of the CPU. The second part contains the CPU-NB, and HTT. In here everything is still connected by the FSB of the CPU, and each part has its own speed. So, the CPU-NB and HTT have their own speeds, and they work the same way as the CPU cores. Simply put, they both have their own multiplier and they are directly affected by the FSB. For example let us look at the 810 once more at stock speeds. As you can see, it’s just as simple as the CPU core speed calculation. One thing you should notice right away is that the CPU-NB and the HTT are using the same multipliers at stock settings. Remember they have their own separate multiplier but they do in fact run at the same speeds at stock. One important thing to also note and always remember is that the HTT speed can never go higher than the CPU-NB speed. The speed of your CPU-NB is the max speed of your HTT. There are several different methods to overclock the HTT and CPU-NB. First, just try increasing the multiplier. This method only works with Phenom II BE chips though. The other way is to increase the FSB. I will use the 940BE in these two examples. As you can see, very simple to understand. Do not start overclocking your CPU just yet: there is still one more section to cover before putting it all together. In the next section I will talk about the CPU-NB a lot more. When the North Bridge (NB) of a Phenom II is discussed, it is safe to assume that they are talking about the CPU-NB. 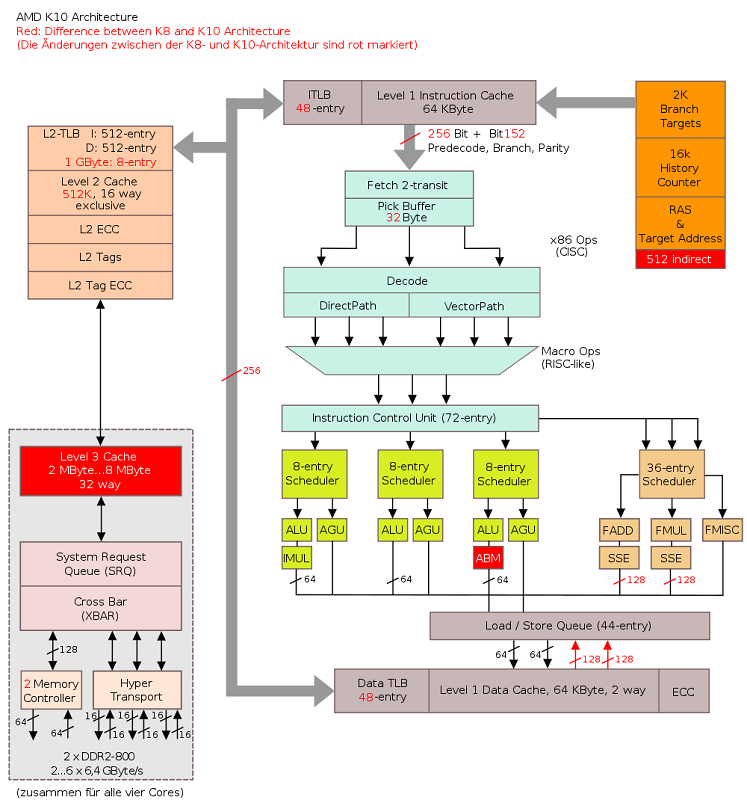 The CPU-NB is the section of the CPU that controls the L3 Cache, IMC and the HTT. As mentioned before, the CPU-NB and the HTT have different multipliers: please remember this. The CPU-NB is probably the most complicated part of the Phenom II. Mostly because it is usually the culprit of bad overclocks. This is mostly due to how much work it has to do: the CPU-NB is the controller of memory. What needs to be stored will go through this guy first. If your CPU is too fast and your CPU-NB is too slow, you will create instability. If your CPU-NB is too fast, your memory may become unstable, or your CPU may become unstable. How you should approach the CPU-NB is pretty simple: resort to changing the CPU-NB as a last step. Work with it when you need to. Play around with it, and see how it affects your system in both stability and speed. You may find that the highest CPU-NB frequency is not necessarily the fastest or the most stable. You should think of the CPU-NB as the wing man, hooking up the CPU with the memory. I mentioned in the Memory section that the Memory has limitations due to the CPU-NB. The reason for the memory limitations is mostly based on how the CPU-NB was built by AMD. To be blunt, the Phenom II CPU-NB is not the best. Even though it is a lot better than its ancestors, it still has a long way to go. Most of the time, you will be required to have a pretty high voltage on the CPU-NB with a low frequency in order to keep your CPU stable. This leads to less headroom with your CPU because the CPU-NB is now creating extra heat on the die. Yes that is correct, the CPU-NB also creates heat on the die. I have constructed a table outlining the settings at which your CPU-NB should be with ‘X’ CPU Speed. Please note that there is a +/- 200 MHz difference for each step. In order to find your speed without my table, you can use my formula: CPU-NB Frequency (+/-200) = (CPU-Frequency * 2 ) / 3.15. Along with the formula, Table 4 shows what voltage you may need using ‘Y’ CPU-NB Multiplier. These voltages were based off using a 940 using default settings. 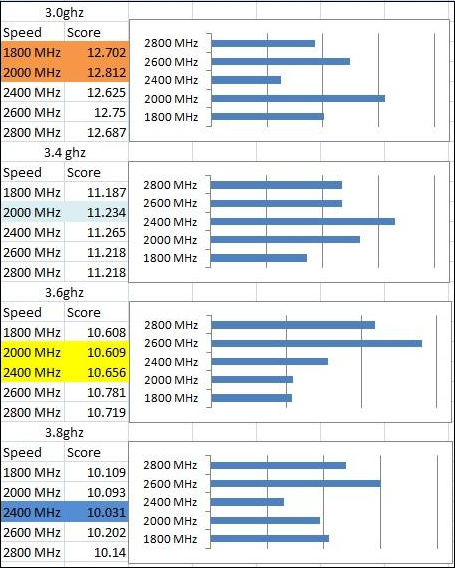 As you can see with Table 3, these are the supposed frequencies of your CPU-NB at X CPU frequency. Of course, as you increase the CPU-NB frequency, you have to increase the CPU-NB voltage. Note that these are calculated speeds, and should not be taken to word. Also note that the CPU-NB voltage should never exceed 1.35 v in any way. Let me put this in practice, before you start to debate my theorem. Now that you have seen actual data charts you can criticize my theorem, do not worry I already do it myself. In practice it does not work 100%. Actually I have Super Pi 1M, 3D Mark 06, PC Mark 05 and Geekbench charts as well showing that the 2800 MHz NB usually is top of the charts rather than the recommended speeds by my calculations. Which to me, is fine. The idea behind the formula is a rough estimate of what you should be at with ‘X’ CPU Frequency. What you should get from this section is an understanding of the importance of the CPU-NB and how it affects your overclocking process. By all means you should think about looking at the CPU-NB each and every time when trying to push for a different CPU Frequency. Even though I did say to resort to the CPU-NB last, it is still important to always refer to the CPU-NB when trying to create a more stable environment. You finally get to overclock your CPU [rejoice]. The next section is divided into three main parts. First is “The Old Fashioners”. This section is intended for those that do not have a B.E. Phenom II. The guide will work with all Deneb, Heka, Callisto, and Thuban CPUs. The second section is “Overclocking with Black Edition”. In this section, you will learn how to overclock all Phenom II Black Edition CPUs. The Third section “Crash *Computer Explosions*” has two main sections. The first one gives information regarding what may cause a crash when overclocking. The second section is catered to Thuban overclockers. It gives a couple side notes that will help you overclock your Thuban . If you do have a Black Edition CPU, it is still wise to read through this section. You will not need most of the information, but it does not hurt to learn more about your CPU. Who knows, you may need to actually work with the FSB. To those who do have to use this process, feel lucky. I find using the FSB to overclock the CPU a lot more fun and challenging than the newly fashioned unlocked multipliers. A lot of the time you will spend overclocking, using the FSB, will be trying to balance everything. You have to watch everything: RAM, HTT, CPU-NB, and CPU. If you push something too much, you will have to increase the voltage for that section of the CPU. If that does not work then you have to bring things back down, and figure out how to create a faster overclock at slower speeds. This can be a long process so take your time in trying to balance it all. First thing to do is to find the limit to your FSB . You will increase the FSB by a factor of 10 then by a factor of 5 after that. With each bump, make sure to keep your CPU speed as close to its stock speed. For example if my stock speed is 3.0 GHz which is 15 multi and 200 FSB, when I get to 210 FSB my multi should be 14.5. This is so because we want to force the CPU to stay at stock speeds. Same goes with your HT, CPU-NB Frequency, and the RAM timings, and ratio. Once your computer does not boot up any longer, this means you have found your FSB maximum speed. Now you can move on to seeing how far you can push your CPU. Now that you have found your FSB Maximum, you can now push the CPU to see how high of an overclock you can accomplish. Before we begin, you must understand that there will be a limit to the CPU, and you will have to accept it. Depending on your PSU (Power Supply), cooling, and hundreds of other factors, if you try to continuously push your CPU over the max, you could end up harming it. With that in mind let us get started. Lower your FSB back to 200 stock speed, and bring your CPU multi back up to its stock value. Start pushing the FSB by a factor of 10, and then by a factor of 5. For each successful boot, make sure to run some sort of benchmark test or stress test (Check the section titled: Benchmarking and Stress testing tools for more information). Once your computer starts to crash during boot or during the benchmarks, you will need to try 1 of 3 different options. Your first option is to raise the CPU Voltage. While this will work for the majority of the time, it does not work all the time. I would first try to increase the Voltage before exploring the other two problems. Your second option is to increase the CPU-NB frequency and/or voltage. Please use Table 3 and Table 4 for more information on what CPU-NB frequency and Voltage you should be at. You should first try increasing the voltage before increasing the frequency. It tends to work better. You can push the CPU-NB voltage to a max of 1.35V. If you are having trouble with your overclocked CPU, instead of increasing the CPU-NB try to bring it down. This same process will work as well with the HTT. For the most part you will not have to do much with the HTT but sometimes lowering it below stock will get you to the CPU speed you want. As a rule of thumb you should keep your HTT between 1200 – 2200 MHz when overclocking. The third option that you may want to try is messing with your RAM. You can do a couple of things with your RAM. The first thing you can do with your RAM is to continue to keep it at stock or close to stock. Most of the time, this will work. Yet, there are times where the OC is getting to the point where it needs the RAM to take a step further. You can try to increase your RAM to a higher ratio, and using what you learned about your RAM back in the RAM section, increase the timings to work with that ratio. There is also the possibility of lowering the timings with your stock Ratio and voltage. This seldom works, but has proven to work in some situations. The voltage of your RAM will need to be researched. In most cases, you will not need to exceed 2.4v on DDR2, and no more than 2.1v on DDR3. Please make sure to research this before taking my word though. Overclocking is not always a simple task. Sometimes it takes time to find the sweet spot for your CPU. Make sure to try a variety of different settings until you feel comfortable. Just make sure to work inside the limits of your computer and the limits I have mentioned in this guide. As you continue to increase your CPU speed, make sure to watch the CPU temperature. Once it hits a maximum of 60 °C LOAD, you MUST STOP! You are close to damaging the CPU if you go any further. If your goal is to make your CPU stable, you NEED to lower the settings to have the CPU LOAD temp at a max of 55 °C. You guys have it the easiest, but this time around I’m not going to just tell you what you need to do in order to achieve a high overclock. It is all about optimization these days; getting the fastest out of your hardware, down to the last clock of RAM. Are you ready to learn how to unleash the beast? First thing is first, for all CPUs: find your walls. Even though you have this powerful chip, you are still going to have walls that limit you as to how far you can go. The main one being the Heat Wall (read more about that in my Heat Wall section). For this you will need to get AMD OverDrive (AOD). You can find it here onAMD’s website . This is a great tool to overclock your CPU in the OS environment. I do not suggest using it for 24/7 overclocking though. You will also need wPrime version 1.55 and the latest version of CPU-Z. For the first wall, let us find your max core wall. This will tell you how far you can go, and at what temperature you may be running at. Please note now that you will probably not be operating on a daily basis at the speeds you will see. Sorry. First thing you need to do is get up to 3.4 GHz stable. This should be pretty easy as it should only be using the stock voltages and a bump up on the CPU-NB and HTT, if that. RAM should be at its default SPD settings as well. If you have a Thuban, make sure to turn off Turbo Mode in BIOS. Open up AOD; This tool is designed to do exactly what I am showing you. Make sure you have AOD open and CPU-Z open at the same time. CPU-Z will be used as an accurate tool to show what speed your CPU is at, and what Voltage it is at as AOD is not 100% reliable with this. Now that you are setup and ready to go, you will now start to increase the CPU-Multi by 1 and then hit Apply. Let AOD take its time in setting the CPU Frequency. Once it seems that your System will not crash, open up wPrime v1.55 and set the thread count to 6 under advanced settings. Run wPrime 32M. If no errors are thrown, and your Computer continues to run, this is considered a theoretical potential overclock of your CPU. This does not mean you will be able to run 24/7 on these settings, it just shows that your CPU can handle an instance of intense benching which means there is hope (sometimes very small). With each successful wPrime 32M run, close that program, increase the CPU-Multi by one once more, and hit Apply. Repeat wPrime test, then repeat CPU speed increase until either one of two things happen; either the system becomes unstable due to lack of voltage, or the CPU will get too hot. The Voltage issue is simple, increase voltage. You should know how high you will want to push the voltage, but a reasonable guideline is to not go beyond 1.55V on air cooling. The recommended voltage for 24/7 usage is 1.40-1.45 v. If you run into a situation in which wPrime throws an error, this is considered a theoretical max as well. Although, the reason behind that error could be caused by RAM or CPU-NB, but for now we will consider this as a theoretical max. With these “Theoretical Maxes”, you can now find the max stable overclock with your defined CPU voltage. You are going to need Prime95 or a similar tool for this next part. Here is where we start finding your maximum CPU frequency speed, along with supported speeds with HTT and CPU-NB. In most cases your theoretical max speeds that you have found will not work under the Prime95 test, you may have to increase the CPU voltage, or find a balance with the CPU-NB and HTT. Run Prime95 without changing the settings (outside of CPU Multi, and CPU Voltage) with a theoretical max and see if it is stable. Let us take a step back and look at what you have done so far. For now you have found theoretical maxes to your CPU. These are situations at which your CPU may be able to run at Y Voltage. With this ‘Y’ voltage at ‘X’ speed, you have been able to see if it is stable under Prime95 with ‘C’ CPU-NB settings and ‘B’ HTT settings (where ‘C’ also includes CPU-NB voltage). RAM has been somewhat left alone at this point, staying relatively at stock speed and timing. If all has gone well, you should have found a high overclock that is technically your max with the variables set by the theoretical max found by the AOD testing. As always the lord of all walls is the heat wall. If you have that wall controlled, your overclocking experience will be a better experience. If something goes wrong here is a common list of the error, explanation, and resolution as how to fix it. • Core fails: This happens when a core calculates values outside the frequency causing errors. This can end up causing BSODs (Blue Screen of Death) or Freeze ups. Voltage added to the CPU or CPU-NB can sometimes fix this problem. • BSODS: This is caused by memory instability. The reason behind this is bad RAM or OCed RAM, or can be caused by instable CPU-NB. Changing the CPU-NB frequency to lower or higher settings may help stabilize the OC. Loosening (raising) RAM timings may also help as well or lower the Frequency of the RAM. Voltage may be added to the CPU-NB to help. • Freeze Ups: This may be caused by overheating of the CPU or could be a precursor to BSOD. Check temperature to make sure that you are within range of Max CPU temperature. If this is not the case, follow BSOD instructions. To all those that were expecting a section called “The Heat Wall” here it is in simple form. The Phenom II has a maximum temperature of 55C. If you are anywhere near this sweet spot, OC settings will start to become unstable. No matter what you do, you will not be able to get around this wall. The overclocking ability of the Phenom II is directly proportional to that of its core temperature. In other terms: if the chip is cold it will scale better in overclocking. Note, that “The Heat Wall” will also appear in places you never would expect. For example, if your system is running at 14C load temp, you may only see a maximum OC of 4.2 GHz or something similar. Sooner or later you will run into this wall and you will not be able to break it down. The only way to get around it is if you lower the temperature even further. You will understand this once you encounter “The Heat Wall” for the first time. On a side note, I did mention that the HTT will be used a lot more with Thuban. For some reason, Thubans like to have the HTT just as high as the CPU-NB. It often creates a much more stable environment if you do this. But, on the other hand, it may not work at all. From what I have learned, the HTT likes to stay with the CPU-NB up to 2800 – 3000 MHz. If you go above this, you may want to lower the HTT back down between 2200 – 2400 MHz. As a second side note, some of the newer boards that use the 8-series chips now have a feature called LLC or Load-Line Calibration. This will allow a sort of fluctuation with the CPUv and CPU-NBv. This can be turned on or off. If on, the voltage will have a bit of bigger area of which it can operate. These can potentially even lower the voltage used when in idle mode. If off, the voltage will be set to the specific voltage that you have set in the BIOS. Third side note, turn off Turbo Mode. This is a useless function that has no purpose for now. Only if you intend to run things at stock then use Turbo Mode. Please do not even attempt to use Turbo Mode with an overclocked Thuban. This can cause a couple things: either an embarrassing situation, or a very unstable system. There you have it. A complete guide to the AMD Phenom II family. I hope that you enjoyed this guide as much as I did. Before I let you go, I will end it all with a nice wrap up. Overclocking the Phenom II is a simply complicated task of check, and re-check for hours on hours a day. There is no easy way of doing it, unless you do not want to see the best gain out of your CPU. These CPUs are fun to own, and are a whole other beast when it comes to Extreme Overclocking and cooling. Bringing everything together is the key to making the Phenom II work, and most importantly, keeping it as cold as possible will make the CPU more happy. Check out the Overclockers Benching Team to learn more about how to overclock your Phenom II! Depending on whether you want a stable computer, or just benchmark it before it dies, you need the tools to do it. Here is a common list of tools and a strategy to both situations. SuperPi 32M and 1M: Use this tool to check for somewhat stability. Best used to see if your computer can handle some benchmarks before shutting down. Seti / Folding at Home crunching: Probably the best way to test if your computer is fully stable. Let run for 24+ hours, and you will know if your computer is 100% stable. On the other hand some of you just want to score some great scores using benchmarks. This tends to be a lot of fun for most people. I personally love doing this in my spare time. For most people the following are the most common tools used for comparison of benchmarks. Thank you a lot for putting this together Dolk. I followed it when overclocking two quad cores (965BE and 975BE) as well as a thuban (1090T BE)... It was genuinely very helpful. It took a lot of tweaking for me to put up competitive scores on hwbot.org, but your guide was the baseline I started from. Some of the "rules" or guidelines can be bent when you get to a certain point and you understand what you are doing, but they are valuable in learning how these chips operate. Thanks again! And thanks to the other folks who chipped in on reviewing and editing this, I know a lot of hands helped trim this down as much as possible while still hitting the important points. Just to give an idea of how much was trimmed down. The original Guide that I created is about 50 pages long. This one is about 12 pages. Hope you guys enjoy the new guide. There have been a lot of additional information added that pertains to the Thubans, so I suggest checking that out. Incredible article!!! Im glad it finally is seeing the light of day thats for sure! Cracking article! This will surely become one of the staple go-to guides for AMD overclocking. Just read it through again. I remember reading this when the 720's first came out. This was a nice refresher! Before this was published, I used this as my bible for getting a feel when I finally got an AMD platform chip. This was extremely helpful. It will be a great resource for n00bs and experts alike. The "Dolk's guide" link almost doesn't work. I know the 7xx IGP chipsets (not sure on 785) are all 1.3v. It is a google query link, it works as designed. A google for dolks guide puts his forum thread at the top... His thread gets traffic from people using that keyword in google on a regular basis ("dolks guide"). So you put alink there for someone to have to type it in instead of a direct link? I dont get that but ok. The link works in the article, I just clicked the one in the forum here and its' broken - that is the discrepancy - click the link in the actual article and you will see what I was talking about. I now see what you are talking about with the forum link not working. I grabbed the stock NBv from the Thermal, and Voltage white papers that AMD released. For non-IGP chipsets, yes, but what about the IGP chipsets like the 890GX, 790GX, and so on down the list? If nothing else maybe you should specify the chipset(s) you're referencing. LOL! I had the same thought when I read that! He already listed they were guidelines, and if further information is needed it can be referenced from the document he linked to. If we include every cumbersome detail directly, the guide would be back up to the 50 pages it started at - an avalanche of information can hurt more than it helps.